STUDY ABROAD IN ROME 37 DAYS THIS SUMMER, EARN 6 CREDITS! 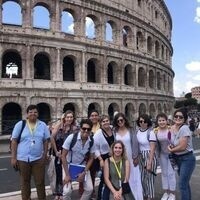 We are pleased to announce the launch of ROMA AETERNA 2019, our summer study abroad program in one of Europe’s most beautiful and historic cities. Participants in the 37-day program will depart for Rome July 3 and return August 10. There will be excursions to Pompeii, Naples, Venice, Siena, and Florence, as well as to sites in and around Rome. Housing will be in a converted palace, only five minutes by foot from our Roman partner institution, John Cabot University. The program is open to UTEP students of all majors, both undergraduates and graduates. Any undergraduate who has completed 18 credit hours of coursework (at least 12 at UTEP) and attained a cumulative GPA of at least 2.67 is eligible to apply. Graduate students must have completed 9 credit hours and have a GPA of at least 3.00. All students will be required to take a 3000-level art history course with Dr. Max Grossman. In addition, they must enroll in a second 3000-level course of their choice at John Cabot University, our partner university in Rome. All JCU instruction is in English, and courses will be offered in art, art history, business, communications, English, film, history, Italian language, photography, political science, and psychology. Most JCU courses are transferable to UTEP, and with the permission of the students’ home departments, may be counted towards UTEP degree plans. Financial aid applies and university scholarships that cover part of the program cost will be available to all participants who are studying abroad for the first time. The total cost will be $7,338 plus airfare, minus any financial aid and scholarships for which you may be eligible. Please write to Dr. Max Grossman at megrossman@utep.edu if interested and come attend our informational meeting Oct. 4 at 5:00pm in Union East, 3rd floor, Templeton Suite 312 or Nov. 14 at 5:00pm in Union East, 3rd floor, University Suite 313.